Amazon is now offering its 7-inch Fire Tablet for the amazingly low price of $39.99. That is 20% off the pre-sale price of $49.99. 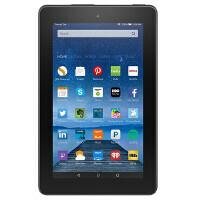 This isn't the first time that Amazon has priced this tablet so cheaply. Last year during its Black Friday sale, the device also sold for $39.99. The tablet features a 7-inch LCD screen, with a 600 x 1024 resolution. That works out to a 171ppi pixel density. Under the hood of the Amazon Fire Tablet is a quad-core 1.3GHz CPU. 1GB of RAM is inside, along with 8GB of native storage. Users actually end up with 5GB of usable storage space. Those seeking additional memory can access the 128GB microSD slot. On the back of the tablet is a 2MP camera, while a .3MP camera adorns the front of the slab. A forked version of Android is pre-installed (Fire OS 5). If you have a penchant for dropping your devices, don't fear. Amazon says that this tablet is twice as durable as the Apple iPad mini 4. The Fire Tablet will give you up to seven hours of book reading, music listening, video watching, or web surfing on one charge. Users will be able to pick from 38 million movies, television shows, songs, books and games. If you're interested in picking up a serviceable tablet for only $39.99, click on the sourcelink. By the way, Amazon is taking care of the shipping.